I sold the shoes through NextDoor.com that I’d thrifted on Saturday after attending my cousin’s housewarming party. I sold an extra cast iron pan, (also through NextDoor.com) I sold another garbage picked clock (Facebook Marketplace) and then sold a thrifted rotary phone through Craigslist. I made sure to deposit all this money into our college fund specific savings account. I went through the annoyingly complicated steps of arranging to automatically pay my son’s rent each month, which will avoid ever having to pay a late fee. I dropped off a library book and picked up a copy of You Are a Badass at Making Money, which I’d spied at Powell’s bookstore and put on hold. A Vera Bradley tote bag in perfect condition. A very large pair of fancy high heels. An adorable pair of dress up chaps. A fancy cloth diaper cover. 5. I didn’t buy a Lear Jet or a vulgar gold-plated apartment in the sky. Awesome Goodwill finds! I totally understand the annoyance of setting up auto payments. I do my mortgage that way so that I am never late. 1. I read our free local newspaper. 2. I filled up with gas when I was in a town that had cheaper gas than where I live. It was still expensive….$2.41 a gal. 3. I boiled eggs for breakfast and brought them to work. I also popped popcorn on top of the stove to take to work for a snack. 4. I cleaned the inside doors and walls of my house with a little Dawn and water. 5. I wore thrifted clothes. I just filled up my car with petrol and it was £5.50 or $7.30 a gallon . Wow, it’s $2.35 here is the southern U.S. I would have to walk if I was in Scotland. Although our (UK) gallons are eight pints, not six as per the US gallon. I’m in Australia and it’s about $1.22 a litre that works out to $4.81 a gallon! Ouch, really? I did not want to know that!! I haven’t lived in an apartment in ages, but when I did, we used post-dated cheques for rent. That’s frustrating that there are multiple steps for automated payment, but awesome that you took care of it all! I put all my grand-daughter’s bills on a Mastercard (except her rent) for the same reason! I send her rent, or rent supplement, directly to her checking account and she pays the landlord, who has now become her friend, despite being about 40 years older than she is. He is the one who suggested she try selling real estate–now has her license and is working in same office he does. He is only selling part time–she’s trying to do more so she can be fully self supporting soon. When she moved, she took everything off automatic pay. When I explained that I was trying to build her a good credit rating, she put them all back on!! If she can pay, she does, if not, I do. She is working hard at it. I’m always amazed that things that are totally straightforward in one country are super complicated in an other – setting up a automatic payment takes a matter of minutes here in Australia and private cheques (checks) are virtually unknown. But can we in NSW cash in our bottles and cans for money? People will be living on Mars before that happens it seems. If only we could pool all the good ideas from everywhere! Come over to Adelaide- you can do it here! UK: banking is free, cheques – very old hat, automated payments are called “direct debits” if the other party is taking the money (e.g. utilities companies) or “standing orders” if I set it up to go out of my account. Minutes to do it all on-line. Recycling – good, but no cash for cans and bottles either. Totally agree Laura about pooling all the good ideas. Even just within England. When I lived outside London, we recycled food. All sent to an anaerobic digester, bugs eat all the food, create gas, burnt to create electricity, fed into the National Grid, local council gets some dosh, no food waste to landfill. In London: too many people to cope with the food waste, so no food recycling (beyond what you can compost safely, IF you have a garden). Hmmmmm. 1. Washed and hung laundry on the line for the shop. Also washed a load for my family! 2. I had to buy crazy-expensive orthotic inserts for my son’s run today. I price checked them in the store with my new smart phone (I’ve been using a dumb phone up until last month, and I’m still adjusting) and they took six dollars off the price. 3. Went to a friend’s house for dinner Sunday. I brought wine from my cupboard, and she provided dinner. 4. My daughter’s friend drove both girls to a sleepover birthday party Sunday night. I was supposed to pick both up, but she needed to take her daughter on errands, so I couldn’t reciprocate. 1. I made both lunch and dinner out of leftovers yesterday albeit with some added ingredients. 2. Found a free Health Care Power of Attorney & Advanced Directive form on the CA AG’s website so that is one less legal document to pay for as we transition everything to our new state. 3. Hubby spent hours cutting off or digging out the remains of 9 large bougainvilleas to enable us to use our small patio without constant pruning. Only purchases so far for this project were a pair of inexpensive work gloves (those thorns are wicked) and a bottle of Roundup root killer. 4. Shopped around for best prices on some of the supplies needed for our 72 hour car bug out kit as part of earthquake preparedness and ended up ordering from Amazon with free shipping. Using an old daypack to hold everything. 5. Did not take that wanted trip to Paris. 1) After answering a Vendor survey I was told they’d send me a free jacket – which I figured would be a cheap windbreaker. I received it yesterday and it’s actually a very nice black polar fleece jacket. YAY for nice swag! 2) I received a pick-up notice in email this morning from the Library. I’m headed out at lunch to pick-up The Glass Castle on audiobook by Jeannette Walls. 3) OK Women in Higher Education is having a Fall Luncheon in November. The cost is $30, but completely reimbursable since it’s work related. 4) I discovered last night I have another NexGuard flea & tick supplement stashed, that I can give our farm dog. I won’t need to buy more until next month, which really helps. I need to p/u more drops for the cat and my other inside fur-baby. 5) I forgot my lunch this morning, but I have a coupon for Taco Bueno, so lunch will be $3 or less, while I’m out running errands at lunch. 6) We finally met our medical insurance deductible, so I plan to go to get an appointment to have a bone density test done before the end of the year. We are going to end up with huge medical deduction on taxes this year, so hopefully we’ll get a nice return. 1. Picked up some school supplies for my daughter at Staples and while I was there I bought some printer paper which we are almost out of. Today I turned in the rebate information online saving a stamp and I will get $6 back making the paper only $3. 2. Took my mother for coffee yesterday. I used up the rest of my gift card. She wanted to go for a ride and stop at a farm market. I picked up some beautiful cheap peppers for snacking. They were very large and cheaper than the grocery stores. I drove my hybrid to save on gas and took my mother on a nice ride. 3. While out I also stopped at Costco to fill my car up. It was close to empty and luckily it was on the way. 4. I’m cleaning up our pool to prepare for closing. We open and close and care for our pool ourselves instead of paying a pool service to do it. 5. Planning on making a chicken pot pie with leftover chicken for dinner. I’ll make a scratch pie crust. I will also be making a tomato soup with some beautiful tomatoes that I planted this spring. Do you have any suggestions for the end of season tomatoes (some red, but sour, some green – and even more sour)? I’m living with my sister and her family at the moment, and their tomato plants are still laden with fruit. As a default, I was just going to make fresh tomato sauce to use in pasta dishes, but keen to know if you’ve got other suggestions (and I’ll look up tomato soup too). I’m not Jill, but I just posted over on the Prudent Homemaker site how to can green tomatoes for frying in the winter. Slice your green tomatoes thickly and place slices in wide mouth canning jars. Cover with boiling water. Add 1 tsp. salt and 1 Tbsp. vinegar to each jar. Leave a 1/2 inch headspace and process 40 minutes in a water bath canner. When you are ready to eat them, drain well, roll in seasoned flour and fry in oil. Enjoy! I make tomato confit. Chop about three pounds of tomatoes into chunks, add in finely diced garlic, add olive oil and balsamic vinegar. Roast at 375 for an hour, stirring once at a half hour. There will be a lot of liquid. Hike oven up to 425 degrees and check and stir every 20 minutes, until the liquid has mostly evaporated and what is left is a thick glaze. Fresh I like it scooped onto rustic bread. Freeze in one or two cup portions and add to homemade or commercial spaghetti sauces or tomato soup and it will add a wonderful, robust flavor. I have exact proportions for canning but it is less trouble if you just freeze it. That pan! I passed on a ss pan at a rummage sale that wasn’t nearly that bad. Now I’m thinking I probably should have bought it. 1. Realized the knobs on the free doors I picked up were much nicer than the knobs on my closet doors. Switched out six and they look great. 2. Bought a big bag of hair clips at a yard sale for $1. I kept several and sold the rest for $2 on a FB board. I also sold a wallet for $2. The small sales are fine with me, as they just pick up the items off my porch and put the money in the mail slot. 3. Have had three people contact me about a Craigslist item. One lady asked that I call her ASAP as she was very interested. When I called, she only wanted to know if I was firm on price. I found that irritating as she could easily have asked that in her email. Meeting someone tomorrow who will hopefully be less annoying. 4. Walked over and picked up my library holds. In addition to the books, I am on Season 3 of Ray Donovan, all courtesy of the library. I was paying for Hulu for a couple months (on hold now) but I think I will cancel it. 5. My office keeps a bowl of candy out for clients/employees. They are getting in some much better choices thanks to the Halloween bags, and I have been enjoying it. Bettypants, I know your pain. Craigslist buyers (and fb marketplace buyers, too) have been soooo annoying lately for me, too. A fella expressed interest in a Cincinnati Reds shirt I was selling, we made arrangements for him to buy it, he was on his way to pick it up….and he never showed up. Another guy tried to talk me down in price on two Lands End outdoors vests I’m selling, AFTER I dropped the price, and AFTER I told him my price was firm. Which it isn’t, but at that point, I had no interest in selling to him (he was rude even before trying to get the price down). Grrrrrr. On the other hand, I love Ray Donovan. Great choice! Thanks for the commiseration! Honestly, I’m getting so annoyed (by no shows and low ballers and lazy people that can’t use a map app) that I should probably take a break from selling for awhile. I feel like the aggravation is outweighing the reward. Bettypants, I was wondering if I should stop for a bit myself…or even if I should continue to do it. Have had two successful sales, and three no shows so far in the past three months. I do have another guy interested in one of the LE vests….we’ll see how this turns out. I had a friend who also used to sell on CL/Ebay/FB boards, and we would complain to each other about the same things. That made it fun, to laugh about it together! But she stopped selling. 1. The Aldis near us have been pricing milk ridiculously low. This past week I paid .97 for a gallon of milk and .28 a lb. for bananas. 2. I received a 10.00 reward coupon from Eddie Bauer. Their long sleeved T shirts were 1/2 off so I got a dark gray one for just over 2.00. I have lots of scarves and a couple of jackets or sweaters with which to pair it. 3. While out, I also stopped at Goodwill and found a nice pair of jeans and a Lands End Squall. The squall I have is much bulkier than this one and is sometimes too hot to wear while grocery shopping or driving. I’m excited to have a cool but not cold weather coat. 4. I was really beat last night and drove past several restaurants and thought long and hard about picking up takeout for dinner. But I remembered I had a Bertolli meal in the freezer I had paid 2.49 for. That paired with cooked carrots made a not spectacular but good enough dinner. 5. This week was my great nephew’s birthday. I saw his grandmother yesterday so gave her his birthday card which was actually a cute note card. I’ve decided to use up the many notecards I have instead of buying even dollar tree cards. He won’t mind especially since there’s birthday money in it! Also, picked up McDonald’s Halloween booklets for 1.00. I gave those to my sister to give the boys for Halloween. They love McDonald’s and that was almost as cheap as making a card and mailing it for Halloween. 1. Was really tired yesterday and wanted to buy something for dinner but made myself an omelet instead with stuff on hand. 2. Finished one library book and started on another. Love to read free books! 3. Brought my lunch (homemade turkey taco soup) to work yesterday and today. 4. Made my 13 year old daughter’s lunch this a.m. to save the cost (which has gotten quite high at her Catholic school) of a school lunch. 5. Rescued a pair of workout tights said 13 year old daughter threw into the Goodwill bag I keep on hand (her Dad bought them for her at Lucy at full price at a price I would never pay and she only had them for a couple of months) and will wear them for my winter runs. I’ve finally gotten back on the ball for cooking now that we’re down to only one property to take care of and have served home-cooked dinners for a full week! I’m especially proud of the totally from scratch veggie soup that I made, complete with a homemade crockpot broth base. Delicious, nutritious, and cheap! We also closed on our previous home sale and now have cash in the bank so that’s wonderful for our peace of mind as well since we can start saving again. I’ve also listed more items on Poshmark as we unpack in hopes of a few more sales. Amazing job on that pan Katy – I think you are a successful flipper/resaler because you can look at something like that and see the potential underneath. And then work your arse off to find it. 1. My neighbor dropped around a bag of secondhand clothes from her daughter, bag of fresh kale, a bag of Russian sunflower seeds to plant, and most exciting to me, a bag of pigeon manure from their aviary. The clothes yielded a couple of good things including a brown pencil skirt that I’ve been looking for to match the brown boots my sister gave me a while ago. The pigeon manure went into the composter where it will work its magic. Pigeon poo is one of nature’s greatest miracles. 2. I made kale pesto and mint and parsley pesto for the freezer as well as having some for dinner last night. It was really delicious. 3. I made chicken stock from a roast chicken carcass we had for dinner on Sunday night. 4. Back to work today after five days off in a fully thrifted outfit. I’m really sorry to hear about the national tragedy in Las Vegas. I was going to ask too. If mine get stuck on, I have my husband spiff them up with a wire brush in the barn. But that leaves rotation marks from the brush–you did a much better job! 1. Made a simple meal of fish, rice and a seasoning packet I was gifted a long time ago. 2. Bought a 25 kilo sack of rice as our rice was almost gone. We save a lot of money by eating various rice dishes about 5 days a week. 3. We’ve been getting some fruit from one of our trees. And even though termites killed my big basil plant, there seems to be some little basils popping up. 4. I spent a bunch of gas driving around a parking lot to get practice on our new-to-us little motorcycle, but we hope it will save gas in the long run. 5. Bought a small container of yogurt ànd milk to make yogurt with. 1. Sold a camera lens on eBay that no longer worked with our camera. 2. Got out our Halloween decorations from last year and put them around the house, including kids crafts, some halloween candles and hand towels I was gifted at least 10 years ago. Spent $1.99 for new stretchy spiderwebs for our front lawn. 3. Washed our car myself instead of going to the car wash. It was filthy! 4. Headed for the library when I was bored of working from home instead of going to a coffee shop and spending too much $$ on a fancy coffee drink. 1) I made a simple but good lunch today, with all ingredients recently purchased from Aldi – flour tortilla topped with nonfat refried beans, shredded cheese, organic salsa and fresh organic avocado. I’m still figuring out which items from Aldi are a good value for me. I’m wondering about the quality of their meat – have not tried any yet. 2) I’m using NextDoor.com to “re-home” our outdoor basketball hoop. My kids no longer use it, and it’s just taking up space. Hoping to find a local family who wants it for their children (I’m offering it for free because it’s huge and will be difficult to transport). I’d like to keep the monstrous plastic and metal structure out of a landfill. So far I have 8 local families who have expressed interest! 3) I sold a tote bag and silver necklace. Both are nice items which I considered holding on to, but I don’t really use them. 4) I ordered my son’s senior pictures today. As usual, I opted for the smallest, least expensive package option. We don’t have a huge family to whom we send pictures, so we always have extra copies. The least expensive package was still $138. 5) Frugal Fail: owning two standard poodles. They are wonderful dogs, but the recurring grooming expenses every 6 weeks are really high (poodles have hair, not fur, which just grows longer and longer). I’ve looked into learning how to do it myself, but it is not possible primarily given their size, weight and general jumpiness. If we ever get another dog, it will be a very tiny one that I can wash in my sink. Miniature poodles or toy poodles? Both are small dogs and you get the benefit of the lovely poodle temperament and the no-shedding hair. I’m a Cocker Spaniel girl myself (English not American – they always look like someone “punched them in their mooie”, as my Essex nephews would say. Meaning – punched them in their face.). How do you find goodwill outlet stores? I used to live near a pay by the pound one but I have no idea how you even find those. I looked it up on Google I think. I live in NY and the closest one to me is in New Hampshire–not visiting very soon. I think I Googled it, too. The nearest one to me is in Dayton (Ohio), which is maybe a 30 minute drive from home. Very doable, but not somewhere I can run in to on the spur of the moment, given my work and home/family duties. Maybe that’s a good thing, because it’s a gold mine of goodies. Elizabeth, I’ve been to that Goodwill outlet and it’s a madhouse. People come and stay all day and swarm the bins when they come out. It’s pretty stressful and I’ve never found anything worth the stress there. On the other hand, there’s a great thrift shop across from it called Valley Thrift and one less than a mile away called Village Thrift. Valley Thrift in particular yields some great stuff on a regular basis! If you decide to go to the Goodwill Outlet and are disappointed, try those two stores and the Goodwill near there to make it worth your time. Hi, Shelia! There are a few Valley Thrifts closer to me, and a very small Village Thrift (might be the same chain?). All are “okay” for thrifting, but more often than not, I come away empty handed. My fave close to home is a St Vincent de paul. On the other hand, I had great luck at the Dayton GW outlet! I did go on a weekday, early in the afternoon (I was off work that day)..it was busy, but not a madhouse. I focused on looking through the “older” bins, not the new ones (I saw people standing waiting for new bins to come out). I found two vintage paint by number paintings (a passion of mine! Not everyone’s cup of tea, tho), books, clothes (some to sell, some to keep), some kitchen items….I’be already made back what I paid with what I’ve sold. I can totally see where it’s not for everyone…and I would NEVER go there on a weekend. One of these days, I’ll try all three shops – thanks for the tip! Kind of a challenge to find 5 each of these days. Love the frequent posts! But they’re making me feel a bit inadequate . . .
1) Prepped an extra dinner Sunday while making Sunday’s dinner. Popped it in the oven Monday and ate leftovers again for lunch today. We’ll get at least 2 more meals from it – woohoo! 2) In spite of really, REALLY wanting a new pair of closed-toe shoes, I’m wearing ancient ones, newly polished. No one is looking at my feet at work. 5) Still limping along without replacing the totaled car. It won’t be gold-plated or a Lear jet when the time comes, though. I’d love to read a post on how you decide where to sell (Facebook vs craigslist vs nextdoor vs eBay). Also, since you don’t tend to buy super expensive things, how do you spot itms that you know you can resell for a lot more? Do you google brands while looking around goodwill? I’m wondering if selling on eBay is worth it, given the fees they charge?? I think ebay is definitely worth it. Ebay and paypal fees added together roughly amount to 15% of the sale price. So figure you will get to keep 85%. I just sold some discontinued Nerf swords for $55 on ebay. There’s no way I would have gotten anywhere near that price if I had sold them locally. So paying the fees is worth it. It is not usually worth selling small dollar items, or very heavy items if you can’t fit them into a flat rate shipping box. Thanks, Bettypants. Have been considering eBay, but most of what i need to get rid of is small $ and/or too heavy to make it worth it, I think. Business trip edition FFT, I did good but not great. 1. Read that the hotel didn’t have microwaves or fridges (ugh) but knowing made me order small meals since leftovers would not be an option. 2. Took tap water from home for my old nalgene bottle since coastal tap water sometimes tastes mineral-ly to me. 3. Took Luna bars since breakfast was not included. 4. Did Yelp and TripAdvisor research for the group to ensure the choices were the best among reasonably priced options vs. best overall. Got lots of compliments from co-workers. We get a per diem so helping stretch ours and our employer’s dollars. Another commenter here once said it’s frugal to watch everyone’s dollars it’s cheap just to watch your own. I like that. 5. Not frugal but environmentally friendly, did not take any junky freebies I don’t need (cheap toxic- looking eye masks, for example) that would just be clutter until I donated them to a good will that doesn’t need that junk either. Did snag the mini Aveda shampoo from the hotel (Rosemary mint, mmm) but will be sure to recycle the bottle. 1. Having oatmeal for breakfast on these cold mornings we’ve been having lately. Very cheap, filling and tasty when a few raisins are added. 2. Pulled my old fleece jacket out of the closet to wear at home on cool evenings. The jacket is not pretty at this stage of its long life, but it keeps me warm enough that I don’t have to turn on the heat just yet. 3. Went to the library to pick up the latest John Le Carre, A Legacy of Spies. I’m really looking forward to reading this, especially since DH wants to read it as well, so we can enjoy it together. 4. Picked up a free coffee from Starbucks this afternoon. I drank half and put half in the refrigerator to reheat tomorrow morning. I know a real coffee lover would be appalled at this, but I have no issue with reheated coffee. 5. In cleaning out desk, found several old plastic checkbook holders. Have re-purposed one of them as coupon holder in my purse. Coupons do fit neatly into both pockets. Anything to help organize my purse a little bit. #4 – Leftover reheated coffee = a big yay in my household! I reheat coffee at home all the time….seems just fine to me! I reheat tea, too. I make a large pot in the morning and either pour it over ice during the day or reheat it in the microwave. It is quick, easy, and frugal (no waste). -One of the big treats at our house is checking out two copies of the same library book, so we can both read it at once. 1. Made a double batch of granola this afternoon–like I do every week. 2. Still eating homemade cookies but they are almost gone now. I need to know what is in everything, so determined not to buy bakery desserts. 3. Shopped yesterday to assure I would not be giving birthday girl one gift and a promise because I waited so long to buy!! Now if I can wrap it before Saturday, I’ll be happy. 4. Monday I made a big bowl of scalloped potatoes with ham–which meant I only had to heat it up on Tuesday and make a salad. 5. Today I roasted a chicken so tomorrow will be chicken in another form for dinner–either chicken and biscuits or chicken pot pie. Tonight we had mashed with gravy and corn with it. 6. Actually did meal plans for the week, since I was kind of in a rut last week about what to make. It’s helping!! 1. I was up early so I made a double batch of muffins. We ate them for breakfast and the rest will be frozen for future breakfasts. I assembled the dry ingredients yesterday so it was quick to mix them today. The muffins used up most of a leftover can of canned pumpkin. 2. Monday night I attended a gathering of charity crafters. Some were crocheting baby hats to donate to hospitals, some we crocheting hats for seafarers, and others were making things for a fund raising table. Cheap and social fun. 3. I made a big pot of chili Monday afternoon so it was ready for dinner after my exercise class. We are out of Fritos (to go with) so we used the corn tortilla chips we had in the house. 4. I dropped off Halloween decorations that we are no longer using to a “friend” that I met on Freecycle. I’m near her house once a week. 5. I redeemed Swagbucks for an Amazon gift card, taking advantage of the discount on the first one each month. 1. I made peanut butter balls and dipped one end of them in chocolate and told the kids they were “acorns” for a Fall dessert, which was a stretch. I really just wanted something sweet with the ingredients we had on hand. They were delicious. 2. We have been eating simple meals at home. The temptation to eat take out is strong some days but we are doing good this week. 3. We usually take a trip to the mountains this time of year but we are going to stay home and use that money to continue to do home improvements. 4. I am continuing to use my Luna cup, similar to the Diva cup. I don’t know how I managed before I got it. I can’t imagine putting tampons down my already testy, toilet. I also love that I no longer experience leaks and don’t have to think about it for several hours. 5. This weekend I am going with a few friends to the trash to treasure yardsale that stretches along three states. It’s kinda became a tradition for my mom and I. I am making a list of only things I need that I will try my best to stick to it. Since, I don’t really go shopping if I see something I really want I will get it. I spend all year waiting for this trip and usually find great deals. It’s Friday and Saturday but I am only able to go on Saturday because of work. Hopefully, many others won’t be able to have their stuff out until Saturday. I want to go that one, too! I have done parts of The World’s Longest Yard Sale also known as the 127 Yard Sale which starts in Gadsden, AL and ends in Michigan. It is usually the first weekend in August. Although I only shopped on Saturday, it was great fun, but be prepared for the traffic. Yeah, the traffic is sort of a bummer, especially in small towns or communities that participate. Sometimes we just skip those and tried to find the ones at individual houses. The houses that are just peppered throughout the trip seem to be less picked over. 1. Been listening to my library books on CD so to not buy any reading material. I love the library. Someone else mentioned Overdrive for electronic books — I use that all the time! 2. Bought fish tank supplies on Amazon as the prices are about 1/3 less than the pet stores. 3. Am not spending any unnecessary money as I have medical bills to pay. Every time I think “oh, it’s just a few bucks” I think of that Visa bill and my hand stops reaching for my wallet. 4. Gave a friend a homemade gift for her birthday yesterday. I knit washcloths and put two of them in a cute chinese takeout container with a bar of locally made soap. I knit the washcloths all year long and hand them out for birthdays and Christmas presents. 5. Knitted on a scarf that I’m making as a gift for my niece for Christmas. I sell things on Craigslist, and rather than meeting people at my home, I usually offer to meet them somewhere. I’ve met people at a park and ride along my commute, and often at the library near my house. I explain that my house is hard to find, and meeting at the library is easy. When I was selling my car I asked a neighbor to come up, and that was easy, too. our local police department has a spot in their parking lot that has a camera on it. they have told residents they can park there when selling things thru FB or CL, etc. i wonder if the police department has one in your town? if someone wants to buy something from you and doesn’t want to meet at a PD, there must be a good reason why and you would be safer not selling to them at all anyways!! Yup, I see that hauling the table out yourself would be difficult. If you have someone who wants to buy it, I’d invite a friend (or two) over. You could have tea/pizza, and have a couple extra hands to help move the table out! Bar Keepers Friend in an awesome product. I used it on a large All-Clad frying pan that I recently bought secondhand. The pan looks brand new! 1) A friend of mine who is much older took a bad fall last Friday. She dislocated her elbow and fractured her hip. I stopped at Trader Joe’s and bought an orchid to bring to her in rehab. For less than $15, this is my in-a hurry go-to gift. They are always beautiful and appreciated. 2) Per my usual habit, I have been drinking only water and home-brewed coffee. I rarely drink soda, fruit juices, or alcohol. 3) I stopped by my favorite thrift store where I found a wonderful skirt for $4. I had tried on the same skirt at the beginning of the summer at Chico’s when shopping with a friend. I was along to give my opinion not to buy. Delaying gratification saved $70+. 4) My daughter is coming home for a 4-day stay. I am making her favorite roasted pumpkin soup using pumpkin in the freezer and doing some meal planning for her stay. She is in a wedding this weekend of a childhood friend and will take several meals at home to keep expenditures down. As a graduate student, she watches her money carefully. Weddings are so expensive. IMHO wedding spending is out of control. This young lady has 14 attendants. That’s not a typo. 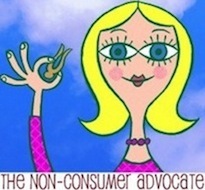 5) Not sure that this is a frugal thing, but it is non-consumerist. I had an interesting conversation with my AT-hiking son about how this 2000 mile journey has affected him. He told me he is much more appreciative of the things that he took for granted — warm meals, a comfortable bed, clean clothes,indoor plumbing and electricity. He also said that he realized how little you really needed to be happy. Gratitude and Grace. Tomorrow will be the last 100 miles. re#5: so glad to hear your son is entering the 100 miles! i love to hear peoples’ stories (or read them) of hiking the AT. it is really such an amazing thing to have accomplished. I agree that weddings are out of control. Thank goodness few of my close friends were interested in marriage. Living in sin is cheap! Heh! So true, Mand01. We hassled my eldest and his girlfriend a bit when they moved in together, but soon realized they couldn’t possible afford rent in their city separately, and even a smallish traditional wedding would set us and them (her parents aren’t in a position to pitch in) more than it would be worth. That shut me right up. She took a job last November that provides spouses with free access after a year to some classes he needs – worth more than $100k if he had to pay for them out of pocket. So we are expecting an “announcement” sometime between November and when classes start in mid-January. I do hope we have a chance to see the actual vows and to throw them a party, but I can understand if they skip the hullabaloo. Okay, I thought I understood, but just writing that ought is bringing me to tears . . . let’s hope there’s a middle ground because his siblings, grandmother and I would probably be miserable if we didn’t get to celebrate with them. Awe, kids always tug at the heartstrings. Bee, That is wonderful news that he is on the home stretch of his adventure! I cross over the trail, in Western Maryland, when I drive down to see my son at UT Knoxville. Every time I’ve gone, while your soon has been on his trek, I wave and say “Safe travels Bee’s son!” when I pass over it. That is so kind. So many of you have been supportive and interested throughout his journey. The NCA community is wonderful. 1. We stayed in all weekend, and I cooked simple meals, like scrambled eggs with frozen vegetables and salsa. 2. My husband, mindful of the budget, chose to stay at home and listen to an audiocast online of his college football team instead of going to the bar to watch it. They lost :(, and while I can’t relate to the disappointment he felt, I know a lot of sports fans get this way. 3. Brought my lunch to work Monday instead of buying the school lunch. 4. Went for a rare coffee shop visit last weekend, and decided to get steamed milk with honey to increase my dairy intake and avoid caffeine. They only charged me 75 cents. 5. Talked to a student yesterday who had a professional manicure. I said she had really nice nails. She looked at mine, which are short, with chipped polish, and said they were “weird.” There are so many women and young women in my town that get manicures as an essential. I’m proud to say I don’t…and I’m proud of my free, simple polish job. There’s nothing wrong with manicures if you have the money, but I need that money for retirement and groceries. That’s terrible she said your nails were ‘weird’! very disrespectful! I know…it’s just the tip of the iceberg in my job. I work with a lot of students who don’t have the best social skills. When someone who was raised by wolves says something disrespectful or hurtful to me, I say something like, “That was not very nice and hurt my feelings. I hope it is because you are thoughtless, not that you are mean.” Otherwise they go through life not understanding why they are not liked at work or by other people. Also, sometimes people genuinely don’t know that what they say might not be ok. For example people with an autism spectrum disorder sometimes say what they perceive to be the truth without understanding that it may not be socially acceptable. I’ve spent 18 years trying to help my daughter to understand that she doesn’t have to say everything she thinks. People with autism also have a gap in theory of mind which can lead to further misunderstandings. Not saying that was the case for that person. My daughter is getting better at knowing that some things are just not ok to say. We had a hard frost last Saturday night and picked all that would have been damaged by the cold. End of the garden is in sight! 1) My food processor and I have been logging some quality time. Today it will be zucchini (shredded and sliced), carrots (shredded), and the last batch of what we have called “green sauce” which is kale, basil, garlic, olive oil and salt. The end of our basil – I remember clearly when Mand was talking about the end of her basil just as it was turning spring here in the US. 2) I emailed the manufacturer of our dog’s favorite toy (ball that dispenses treats when she rolls it around) as we somehow lost the middle part that makes it work a few months back. They are sending me a “sample” insert for free! Hurray for customer service!! 3) Cleaning our short term rental myself. Same old story. Very grateful to have the income and always grateful when I am done cleaning. 4) Repurposing some straw from a successful grass regeneration area to a spot in front of the rental which needed coverage. Saves me buying mulch or more straw. 5) Having bargain spaghetti sauce with additional shredded veggies thrown in (big surprise there) with bargain pasta for dinner tonight. Keep on keeping on everyone! This week I lost some time due to being sick. I also lost out on keeping up with cleaning and cooking so I paid for more convenience food than I’d like. 1. Got back on track tallying my budget so I know where I stand for the next month. Not good, my friends. If I pay attention I can do it, though. 2. Tried to chip away at backlog of dishes so it’s feasible to cook again in our tiny kitchen. a) Repurposed something good and safe instead of buying something new. b) Picked one good cheap option instead of a big package or various options for an item I needed. 4. Reduce takeout from this point on. Brought leftovers for lunch. Made coffee at home. Drank water at work. 5. Took the time to download an e-book from the library for a cookbook I need access to. 1.I found 84¢ in the Coinstar today. YTD $21.85 found money, all coins. 2. Chobani now makes a “smooth yogurt” that is sold in a 2 pack so it’s not Greek yogurt. Since it’s new, there are blinkie coupons for 50¢ off in the dairy case with it. It’s on sale for $1 (reg. $1.79) and the coupon doubles so I got 4 packs for free! Love free food! 3. Did 9 merchandising jobs today. College fund! 4. I found some great clearance items today at Walgreens. Taco seasoning marked down to 10¢ with a 2020 expiration, bought 21. I make a lot of taco soup! Also a 2 pack of Coast soap for 10¢ and 2 boxes of 80 count gallon store brand ziplock bags for 49¢. I only use plastic bags if I’m freezing produce to can later or taking food to people. All for $3.28! 5. Ordered pizza last night for DS#2 for dinner. He’s 535 miles away so we order him pizza the night before any big exams. I order it through the online app and earn credits for free pizzas. I used a BOGO offer and he walks to pick it up. How is this frugal? He had 2 big midterms today. He needs to eat and study and doesn’t have time to cook the night before a big test. So I know he ate which is worth every penny to me. Plus, if it helps him keep his academic scholarship it is money very well spent! Number 5 on your list – plus it’s loving to think of him and take care of him. My sister is away right now and I’m home with her 17 year old son. She rang and told him she loves him: his little 17 year old face was beaming. Never too old to know your mum loves you! 1.Bought a bone in ham for .97 per pound – will freeze for holiday events. 2. Didn’t feel much like cooking, s0 got food at the grocery store which wasn’t take-out, but also didn’t consume much thought or energy: pre-cooked and frozen pot roast for half price. ( fed us plus enough for a packed lunch tomorrow). Also deeply discounted cottage cheese and a pasta mix. 3. Apples are in season. I found that bagged sale apples were 50c per pound cheaper than the same type that came in more fashionable totes. 4. Son helped me bring in my large plants that live on my patio during he summer. They have lived on free sun and rain water for several months and are ready to face the winter sprouting new growth and health. 5. Husband just fixed a lamp which either had a short in it’s system or a ghost living inside which caused it to blink on and off. Err…hello? Fact check on number 5: of course it’s a ghost. Always happens to my lamps. Won’t work, check them, won’t work. Someone walks in and wallop – ghost co-operates and they work. I also have a ghost in my laptop at work: always playing up when there are no witnesses to its transgressions, then IT Man (and yes, they are all men – well, boys to me – at our office) walks in. Ghost goes hidey-hole. Bloody ghosts. And don’t get me started on Gremlins. XD Thanks for the chuckle, Denise! We’ve noticed that the gremlins are more active during changes of season – maybe materials expanding and/or contracting? 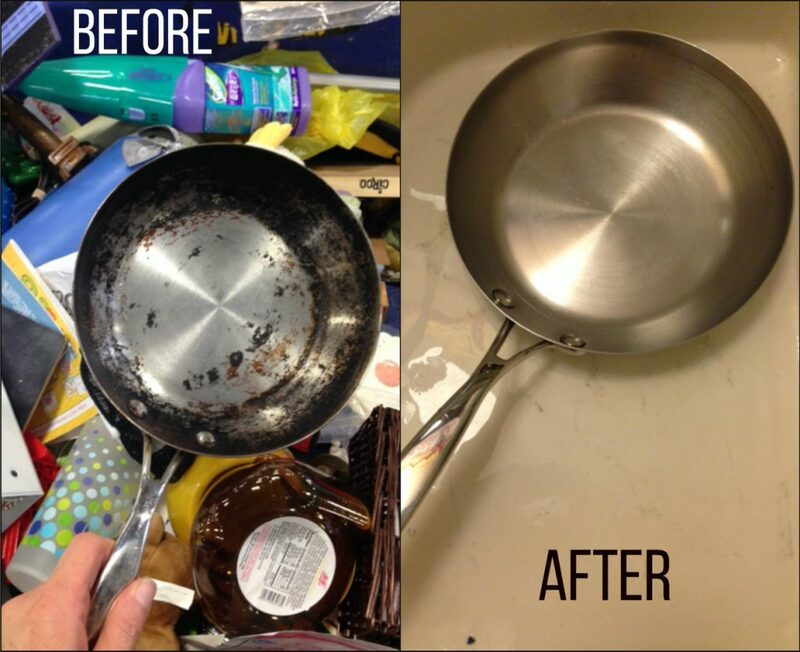 Love how nicely that pan cleaned up. Amazing difference, Katy. 1. Great Clips is having 7.99 haircuts through Oct 13th. I cut my hair myself most of the time, but it’s about time for a professional to take off the rough edges. I wear it short, almost a boy cut, and getting the back can be a little tricky. 2. I sold a couple sheets of thin plywood underlayment ( luan?) to my neighbor friend after she mentioned needing some light weight plywood for a Halloween haunted house. Saved her a lot over buying new, I got it free a couple years ago, and haven’t found a use for it, so I’m getting some space back in my barn. Win-win-win! 3. Rode to and from TOPS with same friend, saving me gas money ( I buy her breakfast at McDonald’s about every 3rd trip, which is still cheaper than driving my older F-150 to town). I also rode to chair exercises with her Mon and Wed.
5. My amarilis is sending out a new shoot! It was a Christmas gift last year, and if all goes well, it will rebloom this year. #1 – I’ll have to check this out. While we don’t have a Great Clips up here (big surprise; we don’t have much of anything up here) we WILL be spending the day in an area with a Great Clips early this upcoming week. I could use one of my “couple times a year” haircuts. My hair is so strange that my husband refuses to cut it (it looks like I have straight hair, but underneath its wavy – but only on one side; the other side is truly straight). I choose a low-maintenance style but it never grows out evenly so I need the occasional “professional help”. Thanks for the heads up! You’re welcome! I have quirky hair, too. Cowlicks in strange places and one lock on the right that curls straight out when it gets too long. At least now that I have quite a bit of silver in my dark hair, I have body. I have a lot of hair, but it was stick straight when I was younger. I really like being able to style it in 5 minutes and have it stay styled. Just got back from a 5 day trip. We shared a condominium with two other friends. It was well priced to start with and sharing made it even more of a bargain (for a vacation rental). We ate one lunch out and two dinners, one of which was during Happy Hour pricing. We made all other meals, snacks, and beverages ourselves.